In the easiest difficulty grinding experience is pretty pointless. You’re gaining levels extremely fast and can finish it quite easily without any item or level grinding required. By the time you get to Cruel (second) difficulty you should be over level 30 and you can start farming the first few areas of Act I without much trouble. Afterwards, you should always try to be at the very least the same level as monsters in a particular area otherwise progression might get difficult, especially if you prefer playing solo and not in groups. Some skill tree builds also aren’t as strong until level 50 or so (dual totems or Freezing Pulse for example) so it’s highly recommended to stay a few levels above the mobs in the zone you’re in. You can take a look at the table below for a quick overview of the monster levels in every zone. I included the waypoint information just in case you need to know which zones have them. If you’re looking for specific quest walkthroughs read this article. Below are my absolutely favorite areas to grind experience, so if you’re looking to gain some quick levels I suggest you do it here. Probably the best of all areas, The Ledge is really straightforward. Monsters include mostly Skeletons which are slow and really easy to mow down either one by one or with AoE skills. There’s also a waypoint in the middle of the zone so you don’t have to spend too many Portal Scrolls if you wish to clear your inventory. Tip: the “sharp” tip of the waypoint always points towards Kuduku and the next area (Rocky Climb). In The Ledge I recommend you simply run from one end to another and clear everything along the way. Reset the instance and repeat. Really easy, fast, and like everything else in Path of Exile best done in groups. There are actually a few areas which are equally good for grinding levels in Act II, but Fellshrine Ruins is probably my favorite zone. Take a waypoint to Church Dungeon Level 1, and take the exit to Fellshrine Ruins immediately next to it. In Fellshrine I found it best to simply follow the road, and once you get to Crossroads exit just reset the instance. Rinse and repeat. If you don’t have Church Dungeon waypoints go to Crossroads and just follow the road east. Monsters in Fellshrine mostly include skeletons and zombies which are both extremely easy to kill, and when you come across Hulking Titans you can easily skip them if you find them hard to kill. Alternatively Church Dungeon, Western Forest, Pools and Streams and Pyramid are all just as good for farming, so take your pick. Without a doubt The Docks is the best area for experience grinds in Act III on any difficulty. Another area littered with skeletons and zombies who won’t cause you any trouble. There’s plenty of room for kiting, and ranged classes will certainly enjoy killing monsters from safe spots over ledges. If you’re level 30 or so after finishing Act II, press the magic “S” button and find a group for The Docks. You’ll be level 35 in just a bit over an hour, making progression through early Cruel difficulty much easier. If you’re trying to go on Merciless, you can easily farm this zone until level 60 if you wish and still get plenty of experience. Docks may be my favorite Act III grinding spot, though it isn’t the most optimal. The typical progression players do (especially in Merciless) is City of Sarn > Catacombs > Library > Lunaris. In Cruel and Normal difficulties I tend to over-farm in Act I & II so I can completely skip XP grinding in Act III. If you really wanted to you can finish Merciless by the time you hit level 50, although there’s not much point. You can just open up Docks and farm there until you’re level 74 with ease. It’s one of the easiest area to farm, has decent drops so you can upgrade your equipment, and you can even get quite a few maps there to get you started. If you’re around level 62 you should still be getting almost 20% of your level by doing just one full Docks run which takes no longer than 10 minutes in the worst of groups. At level 73 if I remember correctly you’ll get about 8% of your level with one full run which is still a decent amount. Before doing level 66 maps I would recommend you try and hit at least the same level in non-map areas: it’s extremely easy and even though it’s a grind, that’s what Path of Exile endgame looks like so you might as well get used to it. As for equipment and defenses you should try and max your elemental resistances and get at least 2,000 health (or 3,000 energy shield), otherwise you might end up dying far too often to continuously get experience. Leveling really slows down after you hit 75, in which case you’ll want to do maps at least level 67, or find a group for Lunaris Temple. By the time you hit level 80 I’m sure you’ll already know what your preferred way of leveling is. Realistically you shouldn’t expect to hit level 100 anytime soon as it takes a tremendous amount of time and effort, but in case you’re planning your character skill tree build you can expect to be level 90 at most. Try grouping up with other players if you’re having trouble progressing, or find a group that just grinds the same area over and over again and farm experience. Once you’re 3-4 levels above the monster’s level in a particular area you should have no problems clearing it alone. Farming experience in groups for a couple of hours may be boring, but it’s definitely better than dying constantly. Remember that dying on Cruel and Merciless difficulty levels will decrease your experience by 5% and 10% respectively, meaning you’ll eventually have to farm that XP anyway. Also it doesn’t really matter what level you decide to go grind for experience, you will have to catch up in levels sooner or later. Simply progressing through quests in harder difficulties won’t give you enough experience points and you WILL have to grind. I suggest you do it early while you’re about the same level as monsters in order to maximize your experience gain and loot. On Cruel and Merciless difficulties try not to have a full XP bar before you engage bosses. In fact I recommend you go attempt to kill bosses just after you gained a level to make sure you lose as little as possible if (or rather when) you die. It’s always best, fastest and safest to do maps with a full group. If your defenses or damage is lacking don’t be afraid to run in and out of fights and play more passively and safely. Once you figure out you gain 1-3% XP for a full 66 map run dying and losing 10% of your experience is a significant amount of farming. I do hope this post helps you at least a little bit to powerlevel your characters as quickly as possible, or at the very least make sure you know where to catch up with levels. If you have any other great areas for farming you like or other leveling tips be sure to post them in the comments below. Path of Exile does contain plenty of features we’ve seen in other Action RPG games, but many of them are slightly or entirely different. The passive skill tree for example is incredibly intimidating for new players, paired with flasks or skill gems or loot system it can be quite confusing and overwhelming for beginners. This fairly long guide written by Malice should help you get a quick grasp on some of the basic features and systems of Path of Exile so if you’re waiting for the game to download or patch I recommend you read it. Sooner or later you will get your hands on some skill gems. Gems must be socketed in your gear to grant access to the skill. Sockets appear randomly on items. The rarity of an item does not affect how many sockets it has. Sockets can be linked. The links are shown as gold bars between the sockets. Support gems affect any skill gems in sockets that they are linked to. Gems you have socketed in gear you are wearing will gain experience and level up, even if you are not using the skills they grant. Flasks recharge slightly every time you kill an enemy. So don’t be afraid to use flasks that are full to keep your life and mana topped up – your flasks are only replenishing their charges when they aren’t already full. Items with great stats might seem like the best choice at first, but don’t neglect sockets. As long as they are socketed, skill gems gain experience whether you are using the skills they grant or not, so keeping them socketed will mean they get more powerful sooner. A good socket arrangement on an item with mediocre stats is sometimes a better choice than a great item with bad sockets. Spend some time looking at the passive skill web, it can appear daunting at first, but it will soon become familiar. Skill points can be refunded, but refund points are hard to come by, so choose wisely. If you’re just starting out and are unsure how you wish to play your character, try to avoid specialising too heavily. For instance, stay away from skills that improve one handed weapon damage if you feel you might end up liking to swing a two-hander. Skills currently come in two main varieties: spells, and attack skills. Any skill that uses your weapon damage counts as an attack skill, and everything else counts as a spell. Attack skills – Attack skills are dependent on your weapon, and so are affected by attack speed, accuracy, etc.. Bonus damage from rings and other gear is applied when using an attack skill. Spells – Spells do not draw their damage from your weapon in any way. They are affected by % cast speed, %fire/cold/lightning damage, %spell damage, and critical strikes. Integer damage bonuses on gear are not added to spells. Traps – Traps are very similar to spells, but are not affected by cast speed or spell damage mods. They are affected by % trap laying speed, and relevant damage mods. Integer damage bonuses on gear are not added to spells. The only exception to this is Town Portal, which is not affected by attack speed, cast speed, or anything else. Support gems only affects skills where it makes sense. For instance, skills that do not already do damage (such as Temporal Chains) will not benefit from Added Cold Damage. Skills that do not already have an area of effect will not benefit from Increased Area of Effect, etc. Gems get experience equal to 10% of the experience you earn. The number of gems you have equipped has no effect on the rate of XP gain. So having less gems equipped does not cause them to gain XP faster than if you had many gems equipped. Gems are not affected by the experience penalty when facing enemies below your level. All classes have a base mana regeneration rate of 105% of their maximum mana per minute. For example, a character with 100 maximum mana will regenerate 105 mana per minute, or 1.75 mana per second. “Increased Mana regeneration rate” modifiers modify the base rate. For example, 20% Increased Mana regeneration rate would result in 105 * 1.2 = 126% per minute. Characters do not begin with any life regeneration, but it is available from gear and passive skills. The regeneration rate of life gained from life leech is capped at 20% of maximum life per second. If you have 1000 maximum life, and leech 600 life with a single attack, it will take three seconds for that life to be applied to your current life. You always get the full amount of life leeched, it is only the rate at which it regenerates that is capped – if you leech a large amount of life during a battle, you may find that the regeneration continues long after the battle is over. Similar to flasks, the regeneration from leech will stop if you reach maximum life. The same is true for mana leech, although the cap is 12.5% of maximum mana per second. Most gear has attribute requirements that must be met in order to equip the gear. These requirements come from the base item type and are unaffected by magical modifiers, quality, or number of sockets. A complete list of gear and attribute requirements can be found here. The level of the base item type. This is the level that the item starts appearing (and is separate from the itemlevel that affects which magical modifiers can spawn on it). See the item data link above for a list with all item levels. Some of the very low-level base items do not come with a level requirement. The level of the magical modifiers. The level requirement for magical modifiers is equal to 80% of the level of the highest-level magical modifier on the item. The highest level requirement of the two listed above is the one that appears on the item. A level 30 character in a level 28 area will see no penalty. Currency item Drops are not increased or decreased in this way when fighting in areas above your level. For the purposes of this penalty, your level is never considered to be higher than 58. Therefore a level 70 character receives no penalty in a level 56 area. Modifiers from the player stack additively with each other, and are subject to diminishing returns. Modifiers from the party bonus and monsters stack additively with each other, and are not subject to diminishing returns. The total player bonus stacks multiplicatively with the total party & monster bonus. Increased Item Rarity % modifiers increase the chances of an item being magic, rare, or unique. For example with a total of +100% increased item rarity, you’d get twice as many magic items, twice as many rares and twice as many uniques from normal enemies. This modifier has no effect on the number or type of currency items, scrolls, or gems that drop. When in a party, only the modifier from the player who lands the killing blow on an enemy is counted. If one of your minions gets a kill, the minion’s IIR is added to yours and the total is used. Magic, rare, and unique monsters have an Increased item rarity modifier for drops. This modifier increases the average number of items that drop from monsters and chests. It does not affect the type, quality, or rarity of item dropped, only the chance that something will drop. There is no cap on the usefulness of this modifier, as monsters can drop more than one item at a time. The base chance for an item to drop from a normal monster is 16%. This varies between monster types, and special monsters have higher drop chances. When in a party, each player in the party after the first gives the equivalent of +50% item quantity modifier on drops. On gems, the bonus is specific to each gem. For instance, Frenzy gets increased damage, while Cleave gets increased attack speed. On maps, increases the item quantity bonus from monsters in the map area. All modifiers have a level associated with them, and will only appear on items whos item level is greater than or equal to the modifier’s level. Lists of available magical modifiers are available in the item data section. The “Culling Strike” modifier (found on some unique items) causes monsters to die if you strike them down to 10% or less life. In general, integer modifiers are applied before percentages. Percentage modifiers using the words “% increased” or “% reduced” stack additively with one another, while “% more” and “% less” modifiers stack multiplicatively. When dealing with weapons, some modifiers that are listed on the weapon itself are applied first, before mods from other pieces of equipment, skills, and so on. This includes anything affecting physical damage, such as increased physical damage, added physical damage, quality etc., and also attack speed, critical strike chance, critical strike multiplier, and accuracy. It does not include elemental damage mods. Similarly, when dealing with armour, evasion, and energy shield on armour, any modifiers affecting those stats that are listed on the piece of armour are applied first. This includes quality and any other mods directly affecting armour, evasion, or energy shield amount. It does not include mods affecting the energy shield recharge delay or regeneration rate, only the amount of energy shield. Imagine I have 100 life, and two passive skills that increase total life by 15%. The total bonus will be 30%, resulting in 130 life. Now imagine I am wearing boots that give +40 life, and have a passive skill that grants +20 life. The integer bonuses are applied first, giving me 160 life, then the percentage bonuses are applied to that subtotal, for a final total of 208 life. Quality behaves differently on armour and flasks than on weapons. On armour and flasks, it stacks multiplicatively with other modifiers on that piece of equipment. Quality on weapons stacks additively with other % modifiers on the weapon. One exception to this is the starting weapon that appears on the beach at the start of the game. Its item level is 1 but it always has one socket of each colour. Items are more likely to receive sockets that match their attribute requirements. So an item requiring only dexterity is more likely to have green sockets than red or blue sockets. You can only put a blue (intelligence) gem in a blue socket, red gem in a red socket, etc. Additionally, two skill gems of the same type can be used in separate socket groups, resulting in more than one usable version of that skill. Skill Gems are only affected by support gems in the same socket group. For example, imagine a piece of armour with 5 sockets. The first two sockets are linked in one group, and the remaining three sockets are linked in a separate group. If you put Cleave and Faster Attacks in the first group, and Cleave, Added Fire Damage, and Added Cold Damage in the second group, you would have two different versions of cleave available – one cleave skill that attacks faster, and another cleave that does bonus fire and cold damage. Small letters appear over the skill icons for each support gem you have attached to that skill. This allows you to differentiate between the different versions if you have more than one of the same skill gem equipped. Each item has a level associated with it that is equal to the monster level of the area it dropped in. The monster level is shown on the map overlay. Rare and unique monsters have +2 to their level, and will yield items with an itemlevel two levels higher than other monsters in the same area. You can check an item’s level by picking it up on the cursor and typing /itemlevel in the chat box. This item level determines which modifiers it can receive, and how many sockets it can receive. For example a level 30 character will have their PvP damage reduced by 79%, while a level 60 character will have their damage reduced by 88%. Level also affects the amount of XP you gain from killing enemies. There are two penalties that are applied, one when in a party, and another based on the relative level of the player and monsters. Both of these are applied at the same time if you are both in a party, and too far above or below the monster level. The player also suffers a penalty to XP if they are too far above or below the monster’s level. There is a safe level range where no penalty is applied, which is equal to three, plus one for every sixteen complete player levels. Any additional level difference in excess of this safe range is called the Effective Difference. So a level 24 character has a safe band of 3+1=4 levels. So from Monster level 20 to 28, there is an effective level difference of 0. 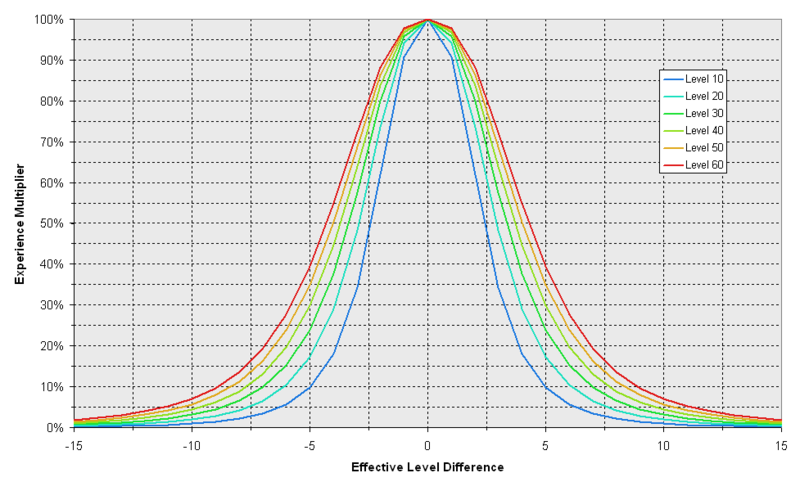 At Monster Levels 19 and 29, the Effective level difference is 1. The Effective Difference matters in either direction. 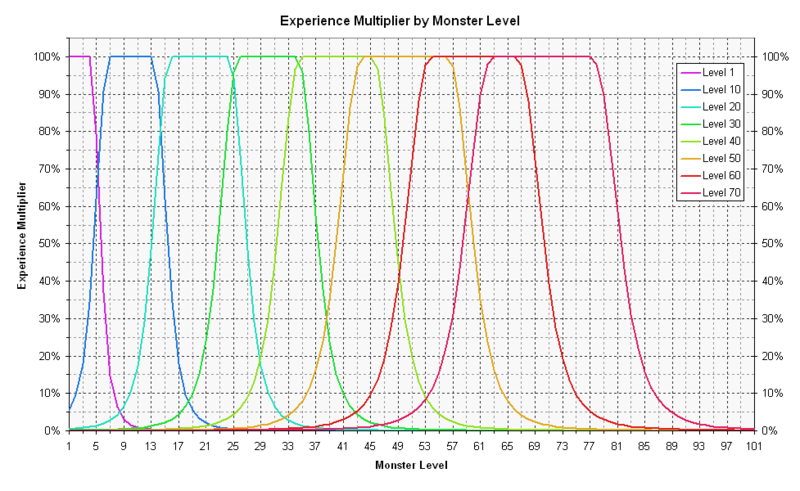 Here are graphs of the experience multiplier by monster level and by effective level. See the drop rates section above for details on how level affects currency item drops. Dual wielding grants a +10% attack speed bonus, and a 15% chance to block. The attack speed bonus is applied multiplicatively with other attack speed modifiers. The default attack and certain other skills will alternate between each weapon, striking with each hand in turn. Some skills (such as Cleave and Dual Strike) attack with both weapons at once, while others only use the main-hand weapon. Non-chaos damage is removed from energy shield until it’s depleted. Any remaining damage (including all chaos) is removed from life. Whenever a player or monster takes damage, there is a chance they will be stunned. A stun interrupts whatever that creature was doing while a brief animation is played. The default length of stuns is 350ms. The duration of stuns can be altered by reduced block and stun recovery, increased stun duration, and similar modifiers. Where defender_effective_max_life is the maximum life of the creature being hit. Increases to monster life from a party of more than one player do not affect defender_effective_max_life. For a player with Chaos Inoculation, their defender_effective_max_life is whatever their max life would be if they did not have Chaos Inoculation. Reduced stun threshold modifiers reduce the value of defender_effective_max_life. For example, 25% stun threshold reduction means you treat their maximum life as only 75% as much as it actually is, meaning you stun them easier. If the stun chance would be less than or equal to 25%, it’s ignored, so you need to deal more than 12.5% of effective maximum life to have a chance to stun. Chance to hit can never be lower than 5%, nor higher than 95%. Evading an attack prevents all damage and other harmful effects from the attack. Only attacks and attack skills can be evaded. Spells cannot be evaded. Blocking an attack prevents all damage and other harmful effects from the attack. Usually, only attacks and attack skills can be blocked, but there are some passive skills that allow you to block spells. Chance to block is capped at 75%. When an attack is blocked, the game first calculates if the attack would have caused a stun were it not blocked. If it would have caused a stun, the blocking animation is played, stunning you briefly. If it would not have caused a stun, then you get a “free” block with no animation. Faster Block and Stun Recovery and Increased Block Recovery modifiers reduce the length of the blocking animation. The amount of reduction is capped, it cannot be more than 95%. The fact that damage reduction scales with the amount of damage means it is difficult to know exactly how much damage is being reduced. An easy to remember rule of thumb is that to achieve 50% damage reduction, you will need an armour rating equal to twelve times that of the damage being dealt. 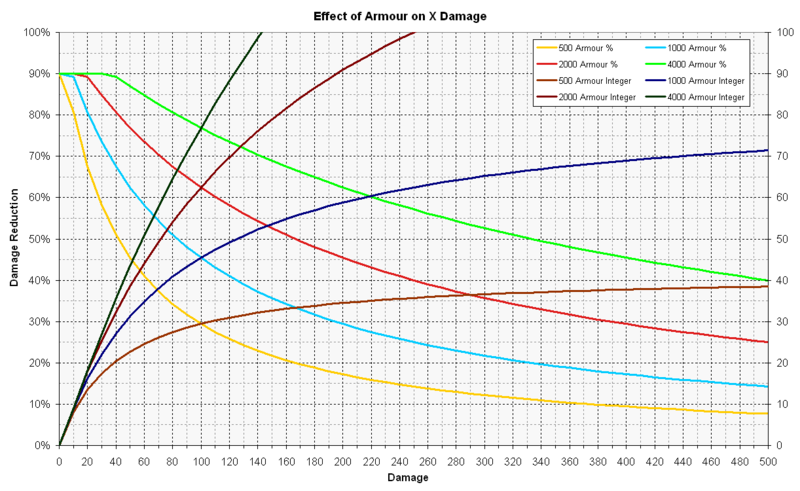 For example, to achieve 50% damage reduction against a 100 damage hit, you’ll need 1200 armour. As long as you have greater than 0 Energy Shield, you have a 50% chance to avoid stun. Energy Shield acts as an additional hit point pool on top of life. If you have any Energy Shield remaining when you take damage, the damage is subtracted from the Energy Shield first. Damage is only applied to life once all Energy Shield is depleted. The exception to this is Chaos Damage, which ignores Energy Shield. So 100% reduction is halving the delay, not removing it entirely. Whenever you use a skill or attack, you have a chance to deal a Critical Strike. Critical Strikes are rolled on a per-action basis, not per-monster. So each time you use a skill, the Critical Strike roll is made once and only once. If you roll a Critical Strike, you will deal Critical damage to all enemies hit by the skill. Critical Strikes do more damage than normal, based on your Critical Strike Damage Multiplier. All characters have a base Critical Strike multiplier of 150%, meaning a critical strike does 150% of normal damage. This multiplier can be increased with various skills and modifiers on items. For instance, with a multiplier of 250%, if you deal a Critical Strike with attack that normally does 100 damage, you will instead deal 250 damage. The chance to deal a critical strike is taken from the weapon used to perform an attack or attack skill, and in the case of spells, each spell has it’s own critical strike chance, which is listed in the skill gem’s description. This value can be increased by increased critical strike chance modifiers from spells and gear. For example, if you are using a weapon with 5% chance to crit, and you have 50% increased critical strike chance, you will have a 7.5% chance to score a critical strike. Critical chance can not be less than 5% nor more than 95%. Critical Strike Chance and Critical Strike Damage Multiplier are calculated separately for each spell and weapon attack. All weapons and damage-dealing spells have a base Critical Strike chance listed on them. This only affects your chance to critical for attacks made with that weapon or spell. For instance the critical strike chance on a wand does not affect your chance to critical with a spell. There are currently 5 main types of damage, they are Physical, Fire, Cold, Lightning, and Chaos. Fire, Cold, and Lightning are collectively known as Elemental Damage. 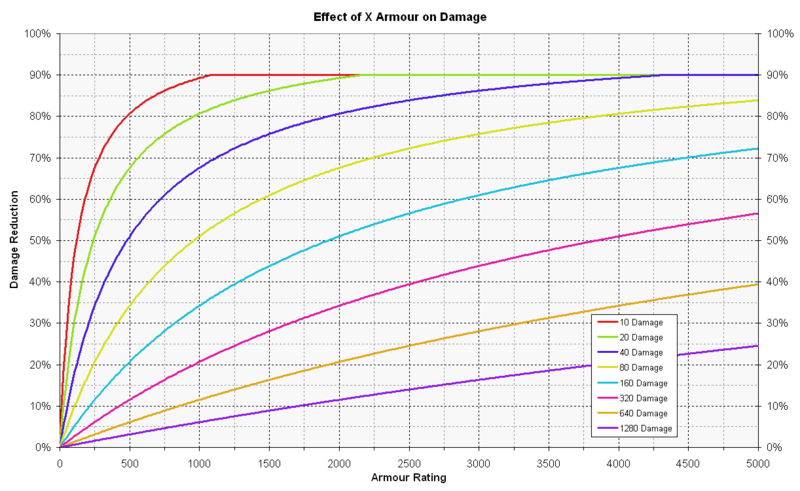 Damage reduction from armour only affects physical damage. Each of the elemental damage types has it’s own resistance value (eg “Fire resistance”) which is viewable in the character sheet. Resistances reduce damage taken, and are capped at 75%. If you land a critical strike with an attack or spell that deals fire damage, the enemy begins Burning. Burning causes damage over time. Humanoids, Monkeys and Sea Witches will flee while burning. Burning lasts 4 seconds, and the amount of damage over time is 1/3 of the fire damage dealt per second. So a total of 4/3 of the original damage, over 4 seconds. Hitting an enemy with cold damage can cause the enemy to be Chilled. Critical hits with cold damage can also cause the target to be Frozen. Chilled enemies move, attack, and cast 30% slower, while frozen enemies cannot do anything except drink flasks. If you land a critical strike with an attack or spell that deals lightning damage, the enemy becomes Shocked. This can be stacked up to three times on one target. In this state, monsters or players take 40% additional damage per instance of Shock. Shock stacks additively with itself, for a maximum of 120% with a stack of three. The damage multiplier itself applies multiplicatively with your final damage, since it it increasing the damage the enemy takes, rather than the damage you deal. Chaos damage ignores energy shield, reducing life directly. Burning, Chilled, Frozen, and Shocked are collectively known as Status Ailments. The duration of the chilled, frozen, and shocked statuses is related to the amount of cold/lightning damage dealt. If the duration based on the damage would be less that 300ms, it’s ignored entirely. Some skills grant Endurance (strength), Frenzy (dexterity), or Power (intelligence) charges. Each charge lasts a short duration before it disappears. Gaining a charge resets the duration of all accumulated charges. Endurance charges are related to the strength attribute and grant +5% physical damage reduction, and +5% to elemental resistances (fire, cold, and lightning) per charge. The physical damage reduction stacks with the damage reduction from armour, so that they are both applied at the same time. For example, if a monster deals 100 damage, and you have 10% DR from two endurance charges, and enough armour to prevent 30 of the 100 damage, the incoming damage would be reduced by 40. Frenzy charges are related to the dexterity attribute and grant +5% attack speed and +5% cast speed per charge. Power charges are related to the intelligence attribute and grant +50% critical strike chance per charge. By default characters can have a maximum number of 3 active charges of each type at one time. This maximum can be increased by certain passive skills. The maximum party size is 6 players. In order to play with your friends, you’ll first need to finish the first zone called Twilight Strand (takes about 5 minutes). To group up with random players use the message board in towns, or open the social window (“S” hotkey) and click the “Public Parties” tab. Monsters gain 50% extra life for each additional party member after the first. For example, against a party of 3 players, monsters have double life. The original life amount is used for the purposes of determining the length of stuns and status ailments from elemental damage – this means monsters will not be harder to stun/ignite/etc. when fighting in a party. Each player in a party after the first gives the equivalent of +50% item quantity modifier on drops. So a party of three will see twice as many drops as a lone character. Increased Item Rarity & Quantity modifiers are only counted from the player who lands the killing blow. For a description on how experience is shared between players, see the level scaling section above. Only party members actually in the instance count toward getting XP. If one member is in town he gets no XP. Experience is only shared with other players who are near you (roughly two screens). Monsters are still made harder by players elsewhere on the level. Being in a dungeon with a party member grants you a 30% experience bonus. Monsters give +50% base XP for every party member after the first. Only the character landing the killing blow on an enemy will gain flask charges. The same is true for all +life and +mana gained “when you deal a killing blow” modifiers. Flasks have a +75% charge recovery bonus for each party member after the first. All areas in Path of Exile are instanced. When you enter an area, a new instance is created. Once you leave the area, the instance will remain in its current state for 15 minutes – if 15 minutes passes with no players entering the instance, it will be closed. Entering the same area again will create a new instance with a new randomly generated map. Areas without side areas attached (any area with two or less exits) has a shorter timer, and will only last 8 minutes while empty. Instances you create are private, and cannot be entered by other players unless they join your party. However, once a player has entered an instance, that instance remains associated with the player even if they leave the party. So it is possible to share an instance with non-party members in some circumstances. The exception to this is towns, which are always public, and cut-throat leagues, where all instances are public – meaning anyone can enter your instances at any time. Some areas have waypoints. Once activated (by clicking on the waypoint), waypoints allow you to travel instantly to any other waypoint you have activated. Ctrl-clicking on a waypoint destination in the waypoint menu, or an area transition will bring up the instance management screen. This screen lists all available instances of the area you ctrl-clicked on, and the time remaining until they are closed. It also allows you to create new instances, and enter existing ones. Using the instance management screen you can have more than once instance of the same area open at one time, and choose which available instance you want to enter. Stash tabs and bundles are on sale every month or two. You might want to wait until they are before you buy them.